There are plenty of advantages that go along with recycling metal in Oak Lawn. Not only does the recycling of metals help the environment, but the economy as well. For this reason, you might be interested in recycling some metal items of your own. The problem is, you may not have any items of your own to recycle…or do you? The truth of the matter is that nearly all homes contains old, metal items that are either scarcely or never used. Your home is no exception this. These items are perfect for recycling. Are you curious as to what household metal items can be recycled? Read on. This blog post will have all the information you need to know. As an American consumer, you’re almost certain to have soup cans somewhere in your kitchen or pantry. These cans are made out of tin and are absolutely recyclable. Though they can usually be recycled through curbside pickup programs, they can also be submitted to metal recycling companies directly. 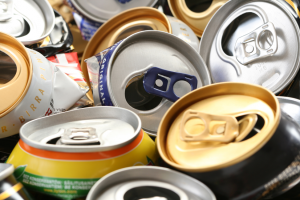 If you’re a drinker of soda or beer, you almost certainly have recyclable metals in your home. Soda and beer cans are made out of aluminum, and are commonly recycled through curbside recycling programs. Again, if you wish, you can also submit them directly to a metal recycling company. They will surely be accepted, and you will be given a monetary payment in exchange. Perhaps you have some old screwdrivers that you no longer have a use for? Maybe you have an entire toolbox filled with miscellaneous work tools? If so, you may want to think about having them recycled. Work tools such as these are typically made out of steel, and can be easily melted down to make new products. Your local metal recycling company will almost certainly accept them. Do you have any old, non-functional bicycles laying around your house or garage? Bicycle frames and components can be, and often are melted down to be used for other purposes. Your local metal recycling company will exchange money for your submission. Another type of metal item that you might be interested in recycling is exercise equipment. Barbells, dumbbells, weight plates, and other such equipment are often made out of steel, and can yield a fairly substantial monetary return. Athletic gear can also be recycled. This includes everything from golf clubs, to aluminum baseball bats, to basketball hoops, to ski poles, and more. Though these items might not be made entirely out of metal, their metal components can be stripped and melted down. There’s a good chance that you have some aluminum foil in your home. While it won’t yield a substantial monetary return, it can be recycled. However, before recycling it, you’ll want to ensure that it’s not contaminated with any food particles. Maybe you have an old bunk bed frame that you’re looking to get rid of? Perhaps your child has outgrown his or her old bed frame? If so, and if it’s made out of metal, you should consider recycling it. These frames can, without a doubt, be submitted to a metal recycling company. Did you recently install a new mailbox? Is your old mailbox made out of metal? If it is, it can be melted down and used to make new products. Looking to Recycle Metal in Oak Lawn? Have you found any of these metal items lying around your house? Are you looking to recycle these metals in the Oak Lawn area? If so, we at Central Metal Recycling have you covered. We are Chicagoland’s premier metal recycling company, having served thousands upon thousands of customers. We serve residential clients, commercial clients, and full-time scrappers alike. Contact us now to discuss your recycling needs!